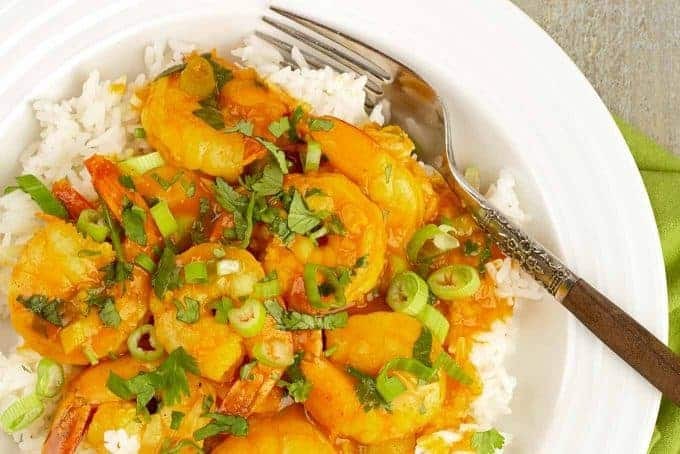 Perfect for a weeknight dinner, this simple coconut curry shrimp recipe is made with easy-to-find ingredients and has a creamy, flavorful sauce with just a little heat and a hint of sweetness. Loads of garlic and fresh ginger, along with curry powder, turmeric and a dash of sriracha combine with coconut milk, ketchup and a splash of orange juice to make the sauce. 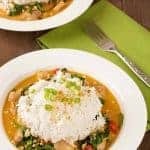 A few minutes of simmering will bring those flavors together, then all that’s left to do is cook the shrimp until tender and finish the dish with a handful of chopped scallions and fresh cilantro. You’ll definitely want to serve this dish over steamed rice (we happen to like basmati) to be sure you soak up every drop of the yummy sauce. 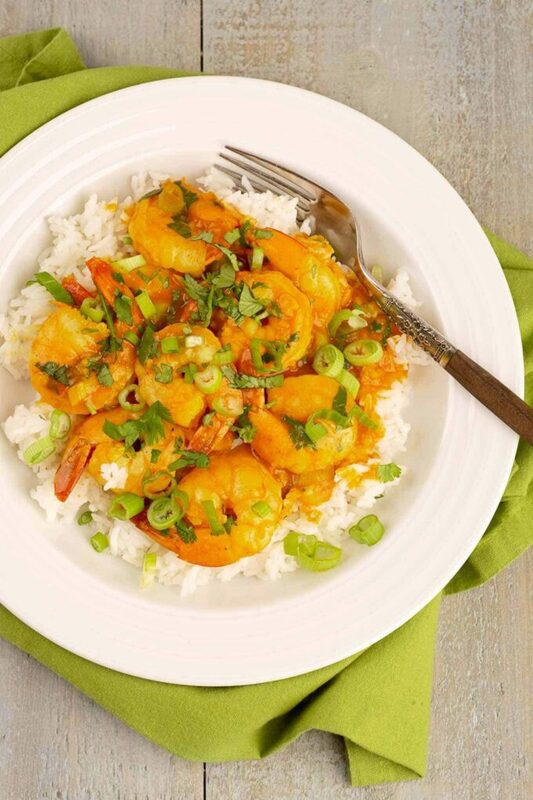 Shrimp is always a great choice for a quick weeknight dinner. Try these! Heat the oil in a large frying pan over medium heat. 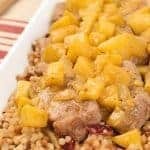 Add the ginger and sauté for 1 minute, then add the garlic and continue cooking until soft and fragrant, 1 to 2 minutes longer. Do not brown. 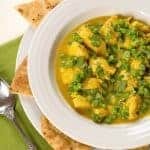 Sprinkle the garlic and ginger with the curry powder and turmeric, combine to moisten the spices and sauté for 1 minute. Add the sriracha, orange juice and ketchup and combine well. Whisk in the coconut milk until blended and bring the mixture to a simmer. Season the sauce to taste with salt and pepper and add more curry powder and/or sriracha if desired. Reduce the heat on the sauce just enough for it to stop bubbling. Cook for 10 minutes, stirring occasionally. Turn up the heat and bring the sauce back to a simmer. Add the shrimp and stir to coat with sauce. Cook for 2 minutes, then add the scallions and half of the cilantro. Continue cooking until the shrimp are opaque all the way through, 1 to 2 minutes longer. To serve, make a bed of rice on four serving plates or shallow bowls. 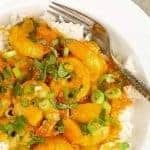 Top each with a portion of shrimp, spoon on the sauce and garnish with the remaining cilantro. 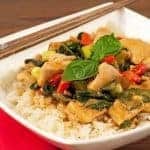 This dish is equally delicious served with wide rice noodles (Pad Thai style) and you only need to make one minor adjustment to the instructions. Once the shrimp are cooked, use tongs to transfer them to a plate and set aside. Add the cooked noodles to the sauce and toss to coat. To serve, plate individual servings of noodles, arrange the shrimp on top and garnish with cilantro. Here’s how you can serve this dish more like a traditional Indian curry. Sauté the garlic and ginger with the spices as directed. Reduce the orange juice to 1 tablespoon, omit the ketchup and add enough milk to the coconut milk to equal 2 cups. Add extra curry powder to taste and substitute a pinch of cayenne for the sriracha. Once the sauce has simmered, stir in 1 cup of frozen peas and cook for 1 minute before adding the shrimp. Spoon the curry into bowls to serve alongside warm naan to soak up the sauce.